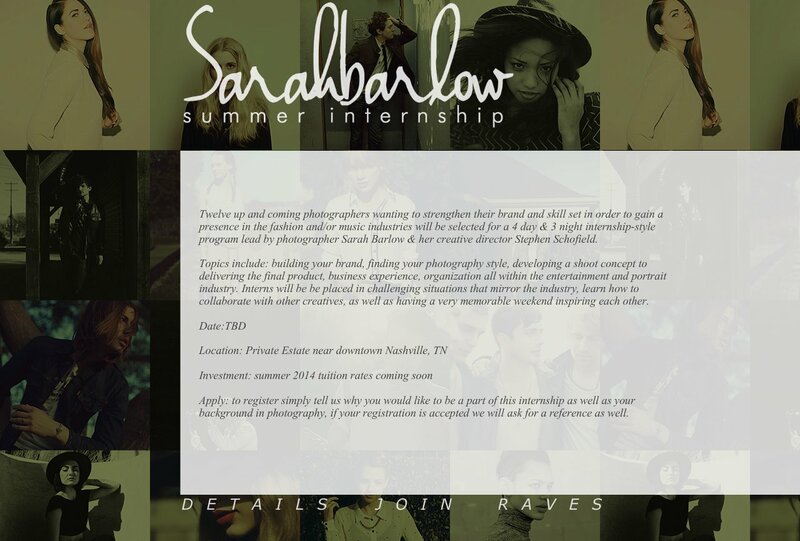 Twelve up and coming photographers wanting to strengthen their brand and skill set in order to gain a presence in the fashion and/or music industries will be selected for a 4 day & 3 night internship-style program lead by photographer Sarah Barlow & her creative director Stephen Schofield. Topics include: building your brand, finding your photography style, developing a shoot concept to delivering the final product, business experience, organization all within the entertainment and portrait industry. Interns will be be placed in challenging situations that mirror the industry, learn how to collaborate with other creatives, as well as having a very memorable weekend inspiring each other. Apply: to register simply tell us why you would like to be a part of this internship as well as your background in photography, if your registration is accepted we will ask for a reference as well.